In September, I created an installation for Rhythmix Cultural Works’ Love Our Island Art Walk in downtown Alameda, CA, as part of their “Radical Beauty” series. Love Our Island Art Walk is an art-centric creative placemaking project that utilizes public art, storefront art installations, and music performances to activate Alameda’s historic downtown districts. 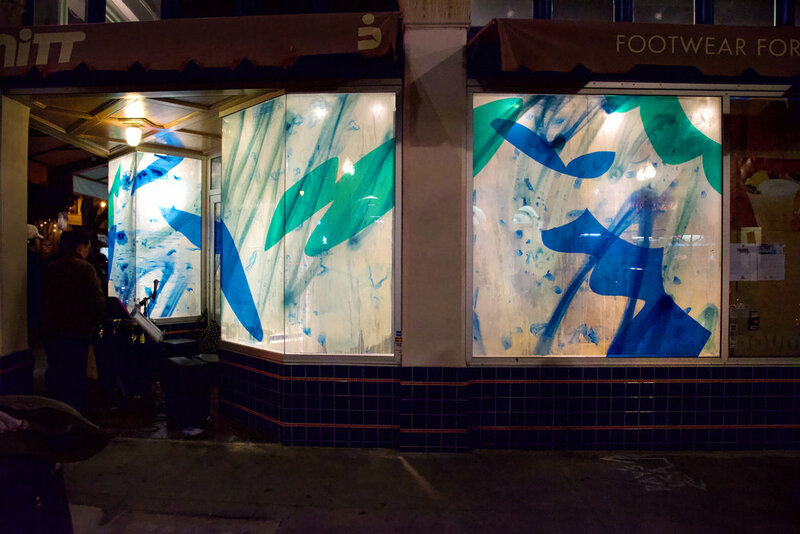 I was given a 40 foot long stretch of windows to work with over the course of two weeks, and created a translucent painting that spanned the length of the vacant storefront. This project gave me an opportunity to combine my painted works with my “stained glass” window installations using colored vinyl and dura-lar. Introducing light was a completely new challenge, and I’m grateful to Rhythmix Cultural Works for providing the opportunity for such a big experiment. Support for Love Our Island Arts Walks come from the California Arts Council, City of Alameda Public Art Commission, the Downtown Alameda Business Association and Rhythmix 2018 Sponsors. 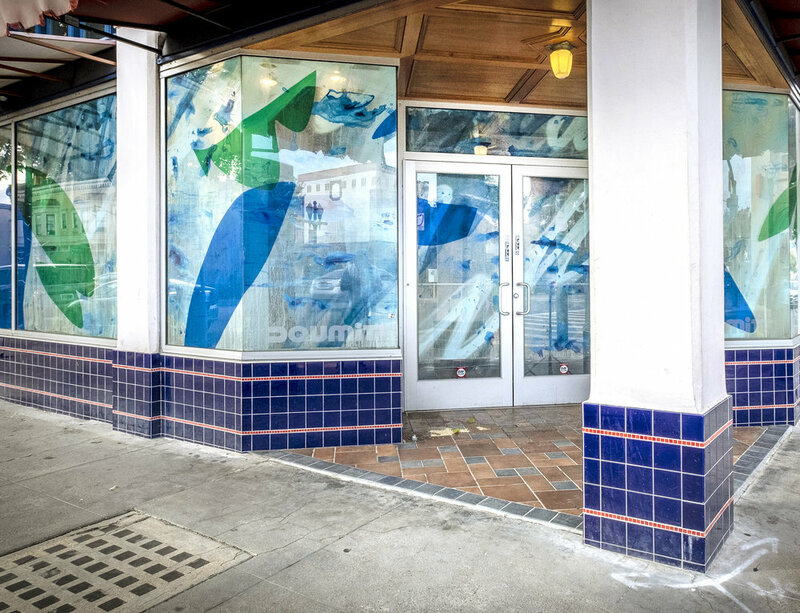 Nicole Mueller activates the corner storefront with a wraparound installation for this pop-up exhibition within a vacant building in downtown Alameda. Best viewed at night, when the interior transforms the piece by creating a lightbox effect, the piece layers clear and colored films to create a translucent, light-filled painting. Merging traditions of stained glass with contemporary abstract painting into a site-specific collage, the piece is made of clear sheets of dura-lar, painted with acrylic and spray paint, layered over transparent colored vinyls that mimic stained glass, cut into bold, graphic shapes. Together the films act as a filter, slightly opaque in some areas while letting more light through in others. Mueller’s paintings, which are typically dense and layered, become airy and nearly transparent here when activated with light. Her process-based works are painted, cut, collaged, arranged and rearranged through an additive process of layering, with the resulting works existing in a perpetual state of flux. While her paintings revolve around an interplay between color and light, this piece “Afterglow” represents a new move that brings together the simple, colored shapes found in her window installations with her process-based paintings, introducing light as a new ingredient into her collaged compositions. In connection with this series on “Radical Beauty,” Mueller aims to beautify an otherwise unimagined storefront, capturing the attention of passerby by presenting an unexpected experience in a public setting, and with her piece “Afterglow” to offer an expression of optimism filled with both color and light.